The playback menu helps you configure how backing tracks and the metronome operate in OnSong. You can access the Playback Menu by tapping on the headphones icon in the menubar. This section of the playback menu lets you choose the linked song to play with the chord chart. If audio tracks are found for the chord chart, they will appear in this area. Swipe to the left or right to choose the track. If no songs are found, or if this control is swiped to the far right, "No Song Selected" appears. You can then tap on the "music stacks" icon to open the Choose Custom Track screen, allowing you to choose a track in your iTunes Music Library. Instead of swiping, you can also tap on arrow icons that appear in the upper right corner of this control. Play/Pause/Stop button controls the playback state of the audio track. Tap on the play button to start playing the track and then tap pause to stop the track. Time Scrubber is a slider that allows you to position where to play the audio track. You can tap and drag or tap on the screen to move to a point in the track regardless of the playback status. The current time elapsed and remaining appears inside the scrubber. Repeat Button allows you to set the playback to repeat after the track has completed. This area of the playback menu allows you to set the tempo of the song, as well as toggle the metronome on and off. Tap on the play icon on the left to turn the metronome on. Tap again to stop the metronome. Tap and drag your finger on the slider to quickly adjust the tempo. Tap on the left or right side to increment the tempo up or down 1 BPM. You can also tap in the BPM field to the right of the slider to type in the BPM using the keyboard. 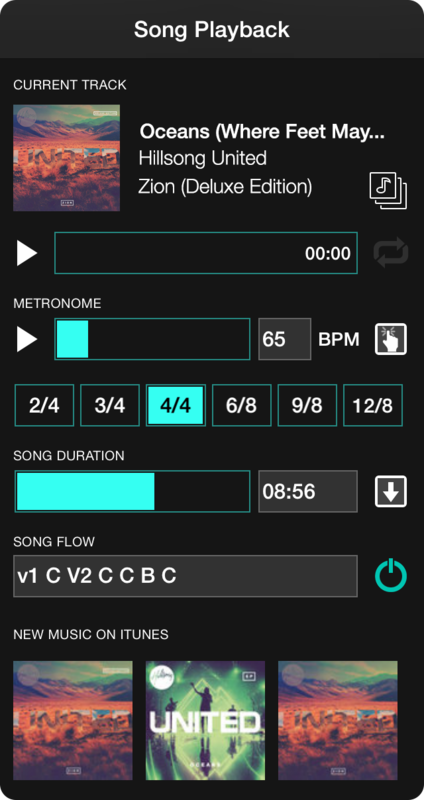 The last icon in the metronome area allows you to "tap" the tempo instead of using direct entry. Note: When a new audio track is linked to a song, OnSong will prompt you if you would like to update the tempo of the song to match the audio track. You can also tap on the Acquire From Song button to the right of the duration slider to prompt OnSong to read tempo and duration from the selected track. Buttons allow you to choose a time signature for the song which effects the metronome. Tap on a button to select that time signature. Tap again on the selected button to remove the time signature. If no time signature is selected, 4/4 time is used for playing the metronome. If you have more complex time signatures not shown in this list, you can set it using the Song Editor. The duration of the song effects how long the song will scroll when using autoscroll. Tap and drag your finger on the slider to quickly adjust the duration. Tap on the left or right side of the slider to decrement of increment the time by one second. You can also tap in the field on the right to enter the duration in seconds or MM:SS format. Note: When a new audio track is linked to a song, OnSong will prompt you if you would like to update the duration of the song to match the audio track. You can also tap on the Acquire From Song button on the right of this control to prompt OnSong to read tempo and duration from the selected track. This provides an alternate way to specify the Flow of the song which is not part of the song content. Type abbreviations in order to specify how your song should be arranged. Once you tap outside of the text area, the song will redraw. Tap on the button to the right to toggle the flow on and off. Turning it off will draw the song as it is written in the song editor. Turning this on will apply the flow to the song. OnSong automatically locates albums and tracks on iTunes that may match the title of your chord chart. These are displayed as album artwork at the bottom of the playback menu. Tap on an album to view the album and song in iTunes for purchase. You can turn off these recommendations by going into Settings � Menu Settings � Playback.